To purchase Blessing Bags at $15 each, please click the button below. You will have an option to select a quantity of bags. 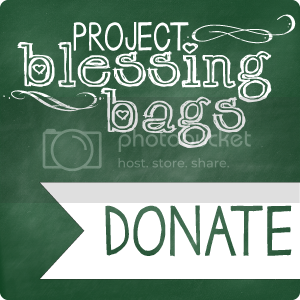 If you would like to make a cash donation to Project Blessing Bags or donate Blessing Bags for someone else to distribute on your behalf, please click the button below. 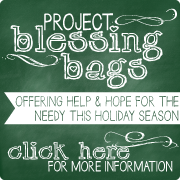 Blessing Bags will be assembled in South Orange County, California in January 2013, and then made available for local pick-up or shipment across the U.S.! If you would like to be a part of the assembly team (individuals and families of all ages welcome! ), please click on the button below to join our contact list. Project Blessing Bags began as a little idea the Garibaldi family had as a way to keep our focus on the giving rather than the receiving during the Christmas season. We wanted a way to resist the ever-increasing temptations of Christmas-excess and keep Christ at the center of our holidays. So as a family, we began to consider some ideas to help us experience sacrificial giving. As the “down-turned” economy persists, the level of need continues to grow, even here in the “Orange County Bubble”. As parents, Kevin and I have struggled with the questions our young children ask when we seen a man or woman on the side of the road with a cardboard sign asking for help. Like you, we’ve struggled between wanting to help, not knowing how to help, and, if we are honest, even doubting at times whether the help is really needed or if the help received will be put to good use or used to fund a bad habit. Then God put an idea on our hearts as a way to be a blessing to those in need, while at the same time giving us an opportunity to bring perspective to our own lives and help fight the feeling of entitlement that we find it so easy to succumb to! As we looked at several options, the Lord continued to steer us down the path of Blessing Bags and as our excitement grew, we felt compelled to invite others to share in this adventure. We decided to invite our friends and family to help us assemble “Blessing Bags” that we can keep in the trunk of the car, ready to hand out at any time to those we come across in daily life who are in need. Included in each extra-large ziploc bag will be a fleece blanket, toiletry items, water bottles, socks, non-perishable food items, a Bible, a Bible tract, and more. 1) PRAY!! Pray that God would be glorified through this project and that all involved (especially the kids!) would receive spiritual blessings of increased faith as we see God provide abundantly! Most importantly, pray that God would use these Blessing Bags to truly be a blessing to individuals and families who are struggling and that their needs would be filled both spiritually and materially. 3) Donate any flat amount of money that you have on your heart to give. We will use your funds to help us purchase supplies and help pay for shipping costs for some of the bags to go back east. We also have people who have contacted us that don’t have the ability to give cash, but have hands ready to help with assembly and distribution. Your financial gifts can partner with their time and energy to bless more! 4) Come out on our assembly day to help put these bags together! We anticipate it to be a very fun and memorable couple of hours for the whole family. Assembly date is tentatively scheduled for Sunday, January 13th, 2013 from 3 to 5 pm, location T.B.D. If you use the “Contact us to be on the Assembly Team” green button above we will keep you informed as the date gets finalized. Okay, so how does this all happen?? Through Paypal (using the green buttons above), you are able to use credit cards for a secure donation, or, if you prefer, you can send a check to Molly or Kevin Garibaldi. If you don’t already have it, please contact us for an address by clicking on the “Contact Us” tab at the top of this website. For a list of Frequently Asked Questions and Answers…Please click HERE. FINAL DEADLINE FOR ORDERING BAGS OR MAKING DONATIONS: FRIDAY, DECEMBER 14th, 2012!! Our hearts are full! We are humbled and again reminded we serve a very BIG God! We are so thankful for all of you and excited to see how God uses us together to be a BIG blessing! What a wonderful thing you have begun with Project Blessing Bags. I completely agree with you that Christmas needs to be so much more about giving than receiving. As you shower blessings on so many others throughout the holiday season and the upcoming year, always remember that you are all such blessings in my life and make me want to be all the more charitable and giving in my life each and every day. I am totally overjoyed and humbled by what you are doing for others.